The Weber Summit S-670 Grill is one of their flagship models. If you are a competition griller, run a steakhouse or just a home cook who loves hosting BBQ’s, this could be your ultimate grilling tool. This unofficial king of grills, the S-670 BBQ is equipped with 6 burners plus a rotisserie, a side burner and a powerful sear station. Love slow roasted chicken or turkey? The high-performance infrared burner located at the back of the grill will allow you to roast like a pro chef. If you are looking for a professional-grade, high end natural gas grill, this is the BBQ for you. Classy and stylish stainless steel unit makes a great centerpiece for your outdoor entertainment area. Available in Propane Gas or Natural Gas versions. 9 mm stainless steel rod cooking grates leave those perfect grill marks on the meat. The humongous cooking output of 60,800 BTUs through its 6 stainless steel burners. The rear infrared burner is specially designed for roasting. The primary cooking area of 624 square inches is big enough for cooking burgers, steaks, roast lamb or beef, pork ribs or kebabs for a large group of family and friends. You will also get a smoker burner that will let you infuse an extra smoky flavor to your favorite meat or ribs. The front mounted control dials are illuminated so that you can operate them easily during night time as well. The Weber Summit series grills are hailed for their rugged and damage-proof design. The enamel coated cooking grates effectively prevent the grease from clinging to the grill making for easy cleaning. The 6 burners are made from solid stainless steel for durability. 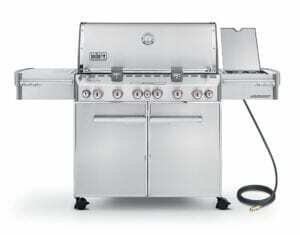 The heavy-duty stainless cabinet comes with four giant casters, in case you need to move the grill from its fixed place. It holds the heat really well and lets you speed up your cooking time. The burner tubes are also sculpted from premium stainless steel. The 9 mm stainless steel rods leave diamond grill marks while searing the stakes and you can clean up the cooking surface without too much effort. The Summit series grill models have set the bar really high for their competitors. Its wide cooking area can cook lamb racks, turkey, in fact, just about anything you can think of for around 15-20 people in a single cooking session. The rear infrared rotisserie burner does an excellent job at roasting chicken, pork, lamb, beef or anything for that matter. Flavorizer Bars are the most talked about feature of all high-tech Weber grills, these iron bars uses the juices from the meat to enhance the flavors. They vaporizes a large percentage of the juices from the meat turning them into smoke and what doesn’t get burnt off ends up in the grease collection trap. This is particularly beneficial for folks who don’t like strong smoky flavors in the meat. The 6 stainless steel burners heat up rapidly and evenly distribute the heat over the grilling surface. To make night time cooking fun and easy, the front-mounted Grill controls illuminate automatically at night. There are 2 grill lights on the handle that come on automatically when raising the lid. The 6,800 BTUs wood smoker box is another feature of this appliance that allows you to extend the flavor of your BBQ with the addition of some wood chips to give a smokey taste. To keep the preparation benches free from mess, there are 3 hooks at the back of the grill which you can use to keep all your cooking utensils handy and out of the way. The unit is pretty heavy, around 300 pounds, yet the setup process is quite straightforward. However, the number of steps is quite a lot so, you will have to spend around 2 hours or more to get the grill ready for cooking. The lid also has a built-in thermometer to keep an eye on the temperature without having to constantly open the lid. The Summit S-670 can be used with both natural gas and liquid propane. If you don’t have a natural gas line accessible in your lawn or patio, you can always go for the easier liquid propane unit. With the natural gas model, you will get a 10-foot long hose to hook up to your gas line. There is room inside the cabinet for propane gas bottle storage. Heavy unit at around 300 pounds. You would need a permanent spot available to situate this grill, although there are 4 heavy duty castors to move it around. The Weber Summit S-670, if utilized to its maximum potential, would give you full bang for your buck. You can use either the natural-gas powered or propane-fueled model, depending on what is more accessible to you, just be sure to purchase the right model. The natural gas version is around $100 more than the propane gas model. Almost every type of meat cooking method, be it roasting, searing, grilling or smoking, is possible with this grill. Just keep in mind your cooking needs and decide accordingly. If you love the look of the Weber Summit S-670 Stainless Grill but don’t need the extra size, why not check out the Summit S-470 Stainless grill over here. Same fantastic Weber Summit features but a bit smaller and cheaper. Available in Propane or Natural Gas. Flavorizer Bars for enhanced flavor. Thermometer built into the lid. Huge cooking area – 769 sq inches in total. Stylish design with stainless steel cabinet and BBQ. 2 lights built in to the handle. 4 heavy duty castors for mobility. Side burner for Wok cooking etc. Heavy barbecue at around 300 pounds. Needs assembling – around 2 hours.